Continuing the trend of the way of lighter weight, more urban stroller products, Mountain Buggy introduces us to the ultra-convenient Nano. Parents, if you travel by air you know what a pain it is just getting there, boarding, and departing. Dealing with a cumbersome stroller and tending your child makes it even more difficult. This is where the new Nano steps in. The easy two-step fold on this lightweight stroller compacts it down to a size accepted by most airlines for carry on luggage. Pop it into the overhead bin and you’re good to go. One easy flick opens it again once you reach your destination. Parents are giving this product high marks for the quality and being feature-rich for the compact size and weight. 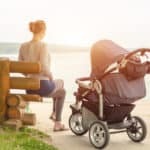 By the time you finish with this Mountain Buggy Nanostroller review, you’ll know how it helps the travel experience for parents be much more pleasant and convenient. 4 Can I use a car seat? 7 What’s the canopy like? 11 Where should I buy the Mountain Buggy Nano? The reclining seat now lays completely flat. The sun visor extends further down and the mesh is replaced with canopy fabric. Seatback flap has both mesh and solid fabric options, whereas before it was an open back with mesh sides. The seat is 12 inches wide with a 19-inch seatback, which is pretty big, allowing for lots of growth room. Eight inches between the top of the seatback to the canopy give tall kids enough head space. A strap recline easily props baby completely upright or reclines to the position just right for napping. Pull down on this pulley strap system behind the seat. It is easy to recline the seat one-handed, but to push the seat into an upright position, you need to use both hands to pull each end of the straps apart. It works well and has a smooth movement. But you must push the seat forward a little bit when your child is in it to sit back up. Air circulates throughout with a mesh panel behind the seat recline. While this is a great feature to have in warm climates, you’ll need to bundle baby up in cooler weather. Or buy the All Weather Cover Pack bug net and rain cover set and be ready for all sorts of weather on your trip. The three-point padded safety harness is easily adjustable, and the buckle has an interesting design. You must use both hands to release the buckle – it has two sets of release buttons. Pressing either set, the grey or the red, won’t release the harness, you must press and squeeze both at once. Pretty simple, you can see it demonstrated in the video review below, but your toddler will stay safe n snug, even if they are normally an escape artist! I like the adjustable footrest that pops up and gives your child lots of support when the seat is reclined. If you’re baby or toddler’s feet don’t yet touch the footrest, the leg support is much more comfortable for them. Can I use a car seat? Mountain Buggy Nano accommodates all major car seat brands because they use a strap system to hold your car seat in place. Additional side bands loop around the car seat handle provide additional security. This is a fantastic option because infant car seat that fits into the Nano will work. The video review later on shows you how to attach the car seat. This is the main selling point – a compact fold that is small enough to fit into the overhead bins in airplanes. The folded dimensions are 22″ x 21″ x 11″. Families use this stroller for their vacation transportation, whether via air, train or in a tightly packed car. 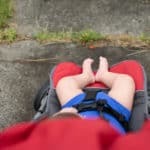 A push of two buttons in the inner frame by the canopy begins the process, dropping the stroller down in two stages, and then it’s the size of a carry-on bag. Pop it into the custom-fit stroller bag or simply carry it by the handle on the frame. 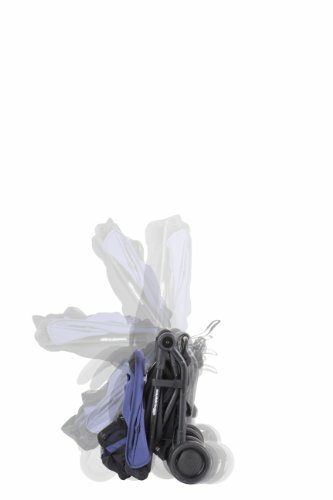 Attach a shoulder strap to carry the stroller with or without the bag. Rear-wheel suspension smooths out the ride and locking front swivel wheels provide stability going over rough sidewalks or cobblestones. Earlier in the Nano production, there had been many reports of the front wheels locking up, but recent reviews say that Mountain Buggy has fixed the problem. 6-inch EVA tires are meant for urban strolling or going through park terrain. Parents like the single handle bar that enables one-handed steering and maneuvering through tight spaces. Although the handle is a fixed height, parents and caregivers of many different heights find that it’s a comfortable position. Reviews from parents who are 5’4″, 5’6″ and 5’9″ all report that the handle height is just right. However, a 6’3″ husband did mention he wanted the handle a tad higher, but he’s pretty tall! A pedal-style one-step linked parking brake is easy to engage. This company listened to their customers last year and have modified the sun canopy on the Mountain Buggy Nano V2. Where there used to be a small flip-out mesh visor, this new visor is made from the same fabric and is more fully extended. This provides much better coverage and sun protection for your child. Some parents have complained that the top of the canopy brushes their knuckles on the handlebar when the canopy is retracted, causing some discomfort. There should be more room between the handle bar and the top of the canopy. You’ll be pleased with the storage basket beneath the seat. The basket is larger than what you’d find in an umbrella stroller, but because this is a compact product meant for travel, the basket is smaller than on most standard single strollers. If you need more space, some parents have remarked that they buy stroller hooks to hang their bags on and that works out well. 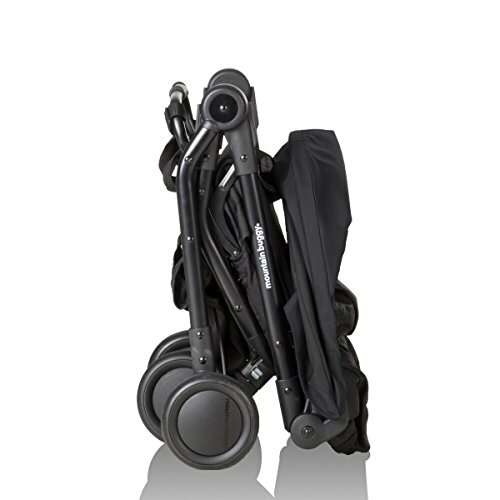 Mountain Buggy Nano stroller reviews give this product about a high rating across several web retailers for the ultra-compact fold, good customer service and use as a travel stroller. Most parents recommend the Nano for the light weight and compact folded size for travel. Traveling around other parts of the world by train is the way to go for many families, and the Nano shines there, too. Storing it in luggage bins, going through busy stations, quick fold and unfold to get in and out of transportation is incredibly easy. Parents love the maneuvering and one-handed steering. They also like the recline for their child, so that while everyone is out and about, baby can still take a comfortable nap and be happy and pleasant later on. Tantrums from crabby tired children are no fun on holiday. Almost unanimously, consumers recognize that for a travel stroller, they are not going to get a huge basket, sun canopy or cup holder. But they do see that the materials and construction is excellent. Consumer Reports rates the Nano as a Best Buy, with an overall high rating. It has “very good” marks for ease of use and maneuverability, and an “excellent” mark for safety. That’s great news from a trusted source! A big issue came up earlier in the year with squeaking wheels and front wheels that would lock straight. Not lock up, but just go from swivel to locked straight, which was a pain for parents to deal with. 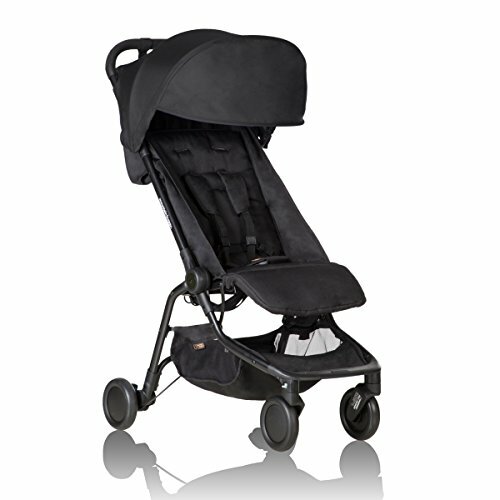 Mountain Buggy has since dealt with the issue and current products no longer have the defect. Several complaints involve the space between the handle bar and the top of the canopy. When the canopy is flipped back, it touches or even covers parents’ hands, which can get hot or irritating. Those are really the only two recurring issues, one of which has been resolved. Where should I buy the Mountain Buggy Nano? 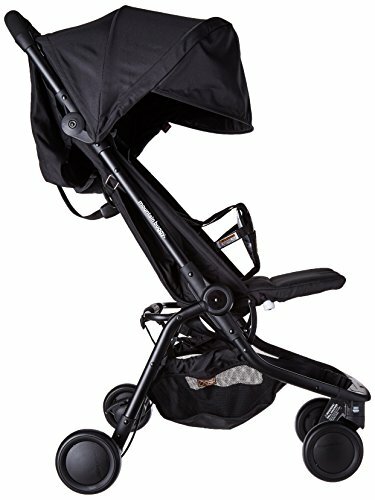 I have constantly seen the best price on Amazon; it is my favorite place to buy strollers with their free shipping and prompt, courteous service. All three color choices are available! Just imagine how convenient and FUN your next trip is going to be with a happy child and a stroller that is so light, compact and easy to use. 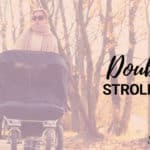 The Best Double Baby Stroller Type – Which One Is Right For You?